Just wanted to post up something I really should have posted last month when the site technically hit the 10 year mark ^^;; Yesterday was actually mine and Danielle's 10th anniversary as well so I guess it was fitting to post this. As for the site, it started as a simple fan site in 2002, dedicated to my love of both Dragon Ball Z and Final Fantasy VII; this sort of explains the fact the site has always had a black, orange and yellow color scheme. Thanks to Toonami and my friend Tiago who now works for Cartoon Network, I became a true anime fan and continued to put more anime series into the site. This time, if some of you remember were the days of the various anime fan sites/shrines... sadly all but a few; this site, temple-o-trunks, deviant art, and Gaia Online..are still left. sadly, it seems QED split and thus I never got that gig, but the short lived success back in 2003 made Danielle and I think up of mascots to the site and a video game I could maybe code in Flash's actionScript. Thus, that's where Project Fumi, now known as Tenshi-Oni, got it's start. Then....came 2004. I was still working at that horrible job at Friendly's icecream while in college for Computer Science mainly studying to be a video game programmer. Oddly, back then game programmers in CS was looked down upon; idiot professors who never worked outside the class room thought game programmers and web designers were "stary-eyed and pointless"...simple put, they wanted us to work mundane data entry jobs at cubical-slave hells like Computer Associates (CA) or Sun Microsystems. CA is/was headquartered here on Long Island with most of the schools like Suffolk Community College and Stony Brook University doing what they could to butter up the execs there by aimlessly prepping us for jobs that one year later.... got sent to Mumbai, India. 70% of the jobs got outsourced and looking back at it, any CS major at that time knew how fruitless the degree was unless.... you became a game programmer. As for me in 2004, I was in a position where I hated the hell I worked at at Friendly's Ice Cream. For anyone looking to work there..don't, let them finally go bankrupt this year and just sell icecream in grocery shelves. I worked 10-13 hours straight with no break and with the worst customers people can imagine....hungry, fat, stupid customers from Selden, NY. The work environment was so bad that I got kidney stones at age 22 from the dehydration of not being able to eat or drink. I weighed a measly 115 pounds at 5' 7". At this same time, my site continued to grow and it was then I was deciding to move on and do something different from the status-quo...and since I saw the "No Track" signs that other in the CS majors didn't..I was checking my options. I at first thought to start a store here on the site (yep way back in 2004)...but before I could further that path and continue building this site & further my Flash animation & game skills...I got a call from a friend of the family looking for help with their business. I thought I was a job interview but it ended up being an Amway business opportunity. I wasn't upset since I am the business type...I simply loath having a boss and my overall goal to this very day is to be my own sculptor of my life. Having a boss and place to "clock in" to is NOT the life for me. Forward a bit from the store's beginnings in 2007 to 2009. That year I got luxury of attending a meeting at the CEO dinning room at Business Week (pre-Bloomberg takeover). My political views and long rants against people like Paulson got me to be one of their top commentors ^^;; It helped with the credibility of this site as now I have a full link back to business week. Later that year, thanks to my contest winners for my store's Banner Contest..I got the ball rolling on the game and mascots I conceived back in 2003... Fumi and the other mascots for the video game later named... Tenshi-Oni. 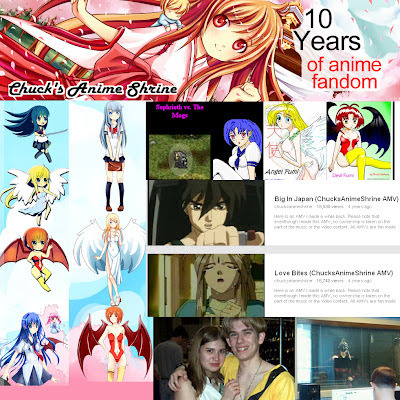 Just before I get into Tenshi-Oni...I can't forget what happened in 2010 with regards to anime and me...I'm speaking of course about me getting involved with anime voice acting thanks to Bang Zoom! Studios. Since then I've taken a number of classes...gotten some booth time and hopefully soon I might actually be a character in a popular English dub ^_^ In the mean time though, thanks to Kenneos and the other fan artists...the game Tenshi-Oni has come to life and is now as I speak an actual game on my iPhone. Kenneos, my fiancee Danielle, my voice acting friend from the Bang Zoom classes, Madi and I will be providing voice work for the game and as you guys have seen...it's coming into focus and though the game was suppose to originally come out last month (delayed mainly due to a move to a new place)..it's happening this year in 2012. As of a few days ago, I got the rights to use amazing music for the game's boss battles (and soon to be made trailer) by the Japanese Gothic Trance artist, Setsuna. The music is in addition to original music made by my fiancee and maybe some written by me. Also, the in-game sprite of Demon Fumi is now complete. With the songs now in the game...expect anime.fm to get geared up for this as I plan on using it to promote Setsuna's work, my own music and of course, any game/anime related music. Also, on a side note...I recently joined the Custer Observatory since my love for space and astrophysics (in part thanks to Gurren Lagann) is something I enjoy and I might soon add more to the site. For example... here's a picture of the Moon I took with my old childhood telescope.... and of course the anime edit that must be done with the Moon. In closing to this long rant...the future looks bright for Chuck's Anime Shrine...some bumps will be on the way (like the whole gallery needing to be revamped thanks to Apple removing their Gallery function -_-) but I hope that there will be another 10 years of this site with more for the fans, more video games after Tenshi-Oni is complete, more Flash animation shorts and of course... more pages dedicated to the anime we love.